Protects your new coffee table or prolongs the life of your old one for off-season storage and inclement weathers. This cover allows you to keep your coffee table dry and ready to use at all times. -Made of environmental PEVA material. It is waterproof with glue coating. -It has two handles for easy removal. -Its draw string with toggle helps the cover protect your patio furniture on the windiest days. 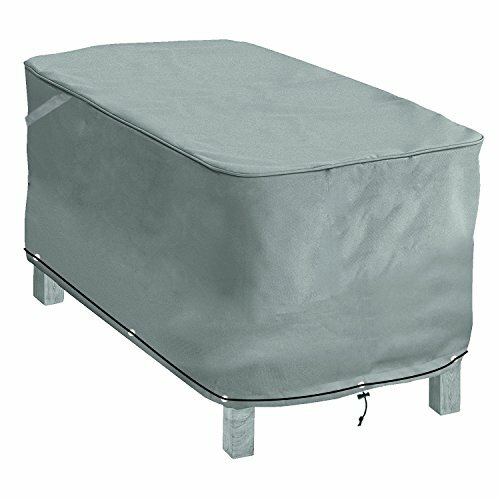 Premium Outdoor Furniture Cover, guaranteed to fit coffee table up to 48" long x 25" Width x 18" high. Reinforced handles make removal easy, draw string with toggle helps the cover protect your coffee table on the windiest days. Outdoor Patio Cover is made of PEVA material, which is eco-friendly, and does a good job on waterproof. Designed to protect your coffee table from dust, dirt, sun, rain and mild snow. UV treated, protects them from the harmful effects of the sun's ultraviolet rays. 1-Year Warranty for Your Protection. Our warranty "covers" your cover in the event of defects in materials or craftsmanship for up to 1 year from the date of purchase.